I have been lucky enough to interview Claire and Sarah about Oranges & Ink, and here we discuss the inspiration for the play and the process from conception to production. Tell us about Oranges & Ink. Where did the idea come from? Claire: A few years ago I wrote a one-woman show about Aphra Behn’s spying (mis)adventures in the Dutch wars. 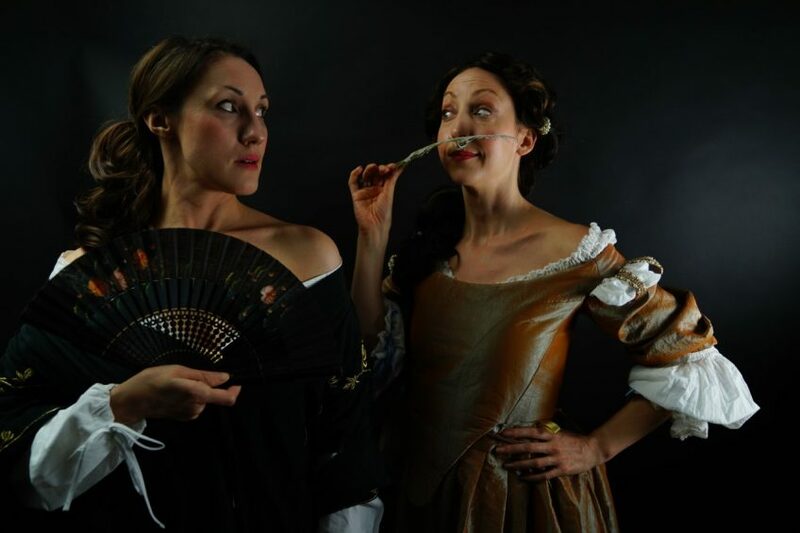 The Masks of Aphra Behn was written for the Women & War season, run by the So & So Arts Club – it received some lovely reviews and went on a tour around the UK. After a year I felt like I’d performed the show as much as I wanted to, for the time being anyway. Then Sarah Lawrie asked me to write a ten-minute piece on the theme of women from history, for the pair of us to perform; this one was for the Glass Splinters season at the Pleasance in Islington, produced by Natalie Harper. Straight away I decided to focus on Behn’s theatrical career and her relationship with Nell Gwyn, which was only briefly touched on in my first play. There’s evidence that the two women were on good terms – they moved in the same social circles and Behn even dedicated one of her plays to Gwyn. And the rest is my creation. It’s also a play about female friendship, set against a backdrop that encouraged women to be at odds with one another rather than help each other along. This is not to say there isn’t plenty of drama in Oranges & Ink. It’s set during one of the biggest social upheavals England has ever had – post-Civil War, but during the Popish Plot and Exclusion Crisis. There are some echoes of events happening today. Paranoia about social and religious groups, and populist leaders using fear and ‘fake news’ as a way to gain power. As it’s a sequel of sorts to The Masks of Aphra Behn, does that mean there may be a third instalment? Claire: Potentially, although I’d really like a week or two off – hopefully somewhere hot – before I start thinking about that! What was it like, the process of putting on a play from writing to production and performance? Claire: It’s really great to work, not only with very talented people (which Alex Pearson, the director, and Sarah Lawrie, who plays Nell Gwyn, certainly are), but also with very good friends. We’re each part of our own production company – mine is A Monkey With Cymbals, Sarah’s is And Tomorrow Theatre Co and Alex, of course, is Alex Pearson Productions. Producing as a team is a big bonus in terms of fulfilling the different roles that are needed. I tried to have all the writing done and out of the way before we started rehearsals, as from that point on I wanted to simply be an actor working on a play. However, before we got to that stage I wrote five drafts. I put the first draft in front of an invited audience, as a reading, which was a kind of baptism of fire but was also incredibly useful. We were able to secure the theatre early on because of the good reviews for The Masks of Aphra Behn. Lots of the marketing strategy was devised by Sarah, who excels in that area – as well as acting, of course! When we got to the rehearsal phase it was a relief for me as it felt like – great, now it’s play time. We just get to play these amazing women. What a treat. And Alex is a really insightful director, and always has exercises or ‘steers’ that open up a character to the performer. And we had a lot of fun. We told a lot of dirty jokes. We discovered we all have potty mouths! And it was great to explore the role of Aphra Behn at a completely different time in her life, and in another context. Sarah, at what point did you get involved in Oranges & Ink, and how did that come about? What advice would you give to people looking to get into play writing or stage performance? Claire: Write about something that excites you. Write a play you would want to go and see. In terms of acting, I’ve worked in commercial theatre, feature films, commercials, corporate films. I’m very lucky, but making your own work has the added bonus of ensuring that the roles you play are fulfilling. And it allows you to tell stories that might not otherwise have been told. Sarah: My career to date has been almost exclusively in theatre and theatre production and I guess my advice to anyone wanting to pursue a stage career is to see as much theatre as possible and really hone your ideas about the medium. It’s also a good way of seeing which theatre companies are doing exciting work and which directors you’d most like to work with. Latterly I’ve started producing my own work, which is another good way of telling the stories you want to tell and collaborating with people you like and respect. I’d also suggest getting involved with rehearsed readings, research and development, and new writing. Claire: Oddly enough, the last thing I saw was Ten Times Table at the Mill at Sonning, which had Sarah in it! Sarah: The last play I saw was called ‘10’ at the Vaults Festival in Waterloo, which told the story of ten real-life women from history who have been largely overlooked or misrepresented by the mainstream, such as Ada Lovelace, Mary Seacole and Gwen John. It had many resonances with Oranges & Ink, both thematically and insofar as it featured an all-female creative team. I’ve yet to see Emilia, but it certainly feels like there is a groundswell of interest in female-led work and female voices at the moment, which has to be a good thing! Where can we find out more about you both and what’s next for you? Sarah: My next project will see me putting my producer’s hat back on at The Brighton Fringe with Death of a Hunter – a one-man play about Ernest Hemingway which premiered at the Finborough Theatre in West London a year ago and which we’re delighted to be remounting. And there’s a very exciting acting project in the pipeline, in which I shall take the role of another brilliant and complex woman – Virginia Woolf – in a brand-new play about her life. Very different indeed to Nell Gwyn! You can see Claire and Sarah in Oranges & Ink, at Tristan Bates Theatre London until 6th April.